​In Dutch Blues, Loura van der Meule borrows imagery from the rich design legacy of her native Holland to create forcefully complex, graphic images that are immediately communicative and relevant to viewers from any culture. The series of sixty-three paintings, collages and works on paper are ordered here into seven groups of nine images. The graphic form of the individual works reverberates and is amplified through their juxtaposition in the grid. Taken singularly, each image is richly complete in itself. Seen in these patterns, the cumulative effect of multiple images is grander and more cinematic. The systems of colors, forms, repeated images, superimposition, and deconstruction become more apparent and more fascinating. 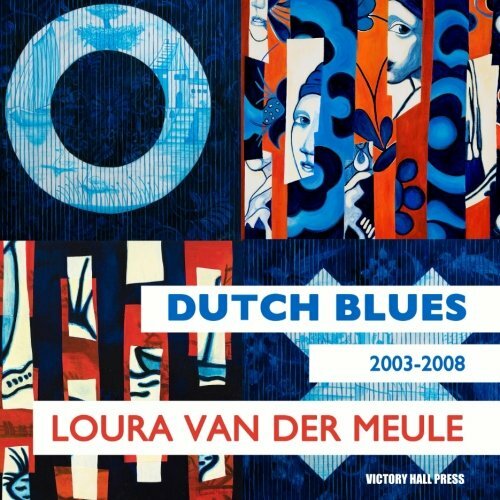 DUTCH BLUES is also available in a deluxe hardcover 12” square version. Contact loura@louravandermeule.com to order. Loura van der Meule was born in the Netherlands in 1953. She studied at the Academy of Visual Arts “Sint Joost” in Breda and the School for Design and Décor “NIMETO” in Utrecht, the Netherlands and first came to New York in 1983 on a grant from The Dutch Ministry of Cultural Affairs. For the last thirty years, Loura has been working in Jersey City where she lives with her husband and daughter. While searching for studio space in Jersey City, Loura convinced the management of a former tobacco warehouse to rent space to artists, and then other artists followed. This became the start of the 111 First Street Studio building which eventually housed hundreds of artists until it was demolished in 2005. Loura was a founding artist of Victory Hall Cultural Center in Jersey City, and also helped start the Drawing Rooms as an arts center in 2012. Her work has been exhibited in museums and galleries in the New York area and has been collected by museums, corporations and private collections in the Netherlands and the United States.